Manufactured by the original Swiss Dumont factory. Forged from premium-grade stainless steel unless otherwise noted and machined to a smooth satin finish. Extensive hand operations are used in shaping, adjusting and finishing the points. Ideally suited for holding miniature parts, gemstones, etc. 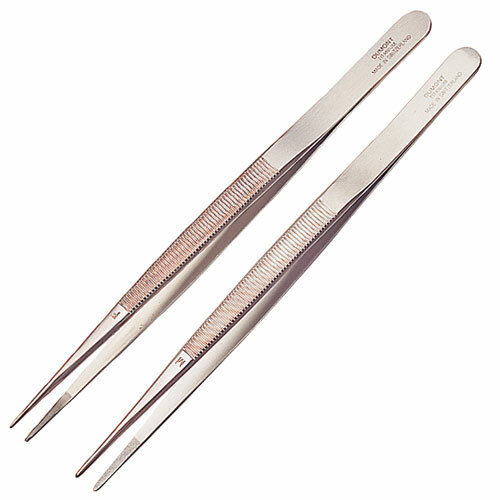 The 100% non-magnetic tweezer is made of titanium which resists rust and corrosion. This tweezer is 60% stronger and 40% lighter than steel, for superior durability and a more delicate touch. Feature finely honed tips. Made in Switzerland. Available in a Medium Tip, 6-1/4" long.